The tall rosebay willow herb and nettles were overgrown along the path to No 52 Mortonhall Way and the key was in the lock of the door. 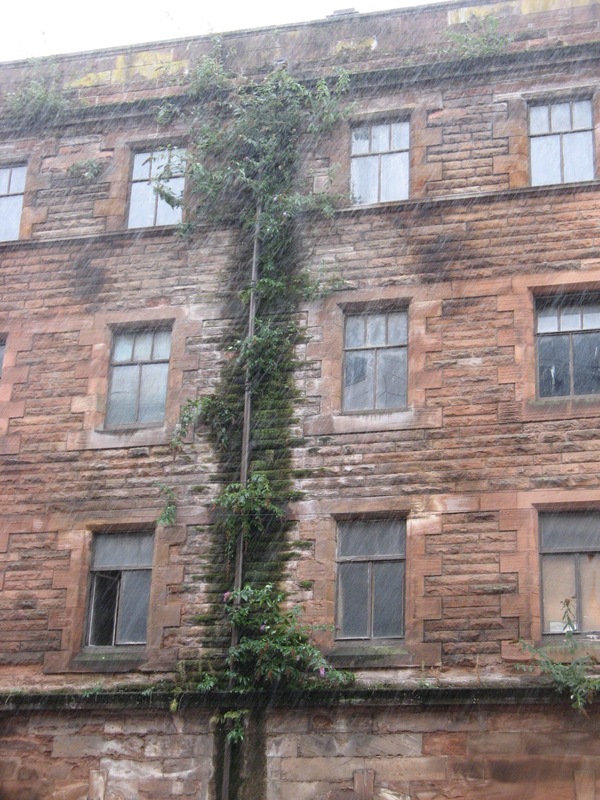 Ellen stood on the pavement and stared up at the dilapidated building. There was the sound of a baby crying coming from behind the sandstone walls and the rainwater fell like teardrops from the cracked gutters. The water splashed over the steps and bounced onto the door as if knocking. She shivered and pulled her coat collar up over her neck to ward off the constant Edinburgh haze. Its cold drizzle was an omnipresence that saturated her clothes, and permeated through her skin into the essence of her soul. She was drowning, drowning in a world of depression. She screamed. A silver cord formed to connect her navel to the door. It was strung with water droplets that bounced off into the air as it pulled tight and tugged her forward up the path. Naked, she snatched at the thread with both hands to jerk herself free, but a cold gust rolled up the street and blocked her escape. The wind engulfed her in a black mist from which bloody hands emerged, to grab her and push her, forcing her up the steps. In the whirlling wind the tough stalks of nettles thrashed and whipped at her bare legs, and the acidic stinging hairs blistered her skin. The rosebay purple flowers shook their heads in shame and disapproval. The door burst open and the cord dragged Ellen into the hallway where she tripped and fell. The flowery wallpaper tore itself off the walls and pounced onto her. The thorns from the roses stabbed her skin until the blood smeared all over her body. A cold baby, covered in afterbirth and with its umbilical cord tight around its neck, was kicking on her chest. Small fists and arms were hitting out at her. The baby’s eyes stared in panic, pleading. The door slammed shut with a loud bang. Ellen grabbed at the pillow on her chest and screamed. ‘It’s Ok.’ Her mother took small medicine bottle from her housecoat and poured some drops of the dark liquid into the tea. She offered it to her daughter. Ellen felt something slide off her legs and pushed the cup aside, she threw the bed covers back. A small bloody partially formed foetus lay between her knees. Ellen screamed, scratched at her face, pulled at her hair, shook and sobbed. Ellen’s mother rushed out of the room and down into the kitchen. She chuckled and laughed and picked up her mobile to called for an ambulance. ‘Are you sure this is the right place.’ The driver of the ambulance spoke into his radio. He looked up at No 52 Mortonhall Way where the tall rosebay willow herb and nettles blocked the path, and the key, still in the lock of the rotten door, had disintegrated with rust.